Who am I? You are an accident. You are a mistake. You are a glorified ape. You are the result of random evolutionary process. That�s it. No rhyme. No reason. No purpose. This is the pathetic reality when evolution runs its full course. If the idea is carried to its logical conclusion, human beings have no value. You are ultimately nothing. Why am I here? You are here to consume and enjoy. That�s the only thing that matters. When the famous philanthropist John D. Rockefeller was asked, �How much money is enough?� he was as honest as any man has ever been. He responded, �Just a little bit more.� Consume and enjoy�that�s why you�re here. What is wrong with the world? People are either insufficiently educated or insufficiently governed. That�s what�s wrong with the world. People either don�t know enough, or they�re not being watched enough. The answers provided by our culture leave us wanting and empty. Let�s now take a look at how God�s Word, the Bible, answers these same questions. Who am I? You cannot figure out who you are until you first discover who Jesus Christ is. Jesus �is the image of the invisible God�. by him all things were created�all things were created through him and for him� (Colossians 1:15-16). He is the exact representation of God. He is the picture of God in human flesh. He is God on this earth. He is God with us, God among us. The Bible says that I am created by God�in his image and likeness (Genesis 1:26). Not the result of random processes. The Bible says that whether I am tall and beautiful or small and not so handsome, whether my body functions perfectly or is severely deformed, I am the crowning glory of the creation of God, and as a result I have inherent dignity, worth, and value. Why am I here? �All things were created through him and for him�. that in everything he might be preeminent� (Colossians 1:16b�18). The ultimate purpose of all things is to bring glory and honor to Jesus Christ. That�s why I exist. That is why you exist. And because of this, contrary to the view of our culture, the reason for my existence goes far beyond consumption and enjoyment. I am. You are. Despite the fact that we are the crowning glory of the creation of God, created to live and bring glory and honor to the Lord Jesus Christ, we are instead hostile and disobedient toward the One by whom and for whom we were created. �All we like sheep have gone astray; we have turned�every one�to his own way� (Isaiah 53:6). The Bible calls this disobedience towards God �sin�, and it says that �all have sinned and fall short of the glory of God� (Romans 3:23). In short, sin is what�s wrong with the world. How can what is wrong be made right? What is wrong can only be made right by the substitutionary, atoning death of Christ. �He [Jesus] has now reconciled you in his body of flesh by his death, in order to present you holy and blameless and beyond reproach before him� (Colossians 1:22). There is no other means by which we can be made right with God. �There is salvation in no one else, for there is no other name under heaven given among men by which we must be saved� (Acts 4:12). The Bible says, �For our sake [God] made him [Jesus} to be sin who knew no sin, so that in him we might become the righteousness of God� (2 Corinthians 5:21). There was nothing else that could have been done that would have allowed God to be righteous and also the one who makes us right. In the mercy of God the Father he punished his Son in our place in order to satisfy his righteous wrath against sin. Our only hope is to believe in Jesus who was crucified for us and rose again (1 Corinthians 1:23, 15:3-4). The sinless Lamb of God gave his life to pay a debt that he did not owe on behalf of sinners who could never pay him back! If these two sets of answers�from our culture and from the Bible�are placed side by side, something very interesting happens. With the answers from our culture, you are left worthless, empty, and hopeless. You�re on your own to pursue satisfaction�and you�ll never find it. But the Bible says you are precious. You have purpose. You were purchased. The only way what is wrong in your life can be made right is for you to believe what the Bible says. Believe that Jesus took the punishment for your sins by dying on the cross as a substitute for you and that he rose from the dead three days later, showing that God had accepted his death on the cross as the payment for the sin-debt that you owed to God. If you believe this to be true, repent of (completely turn from) your sinful patterns of life, and place your faith completely in Jesus Christ. God promises �if you confess with your mouth that Jesus is Lord and believe in your heart that God raised him from the dead, you will be saved� (Romans 10:9). The Answer to life�s ultimate questions is Christ. Those who walk aimlessly through this life will never be satisfied with the answers our culture gives. Christ is the only one who will ever satisfy. Have you entrusted your life to him? Life's Ultimate Questions Tracts - Pack Of 25 by Baucham, Voddie was published by Crossway in August 2011 and is our 567th best seller. 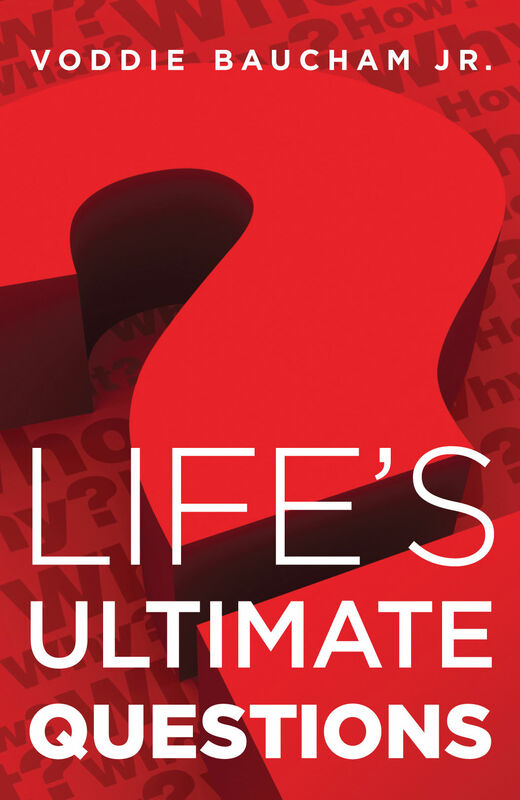 The ISBN for Life's Ultimate Questions Tracts - Pack Of 25 is 9781682161579. Be the first to review Life's Ultimate Questions Tracts - Pack Of 25! Got a question? No problem! Just click here to ask us about Life's Ultimate Questions Tracts - Pack Of 25.